The great news is that I was able to take the AUD/USD short trade! Well, a part of it, at least. 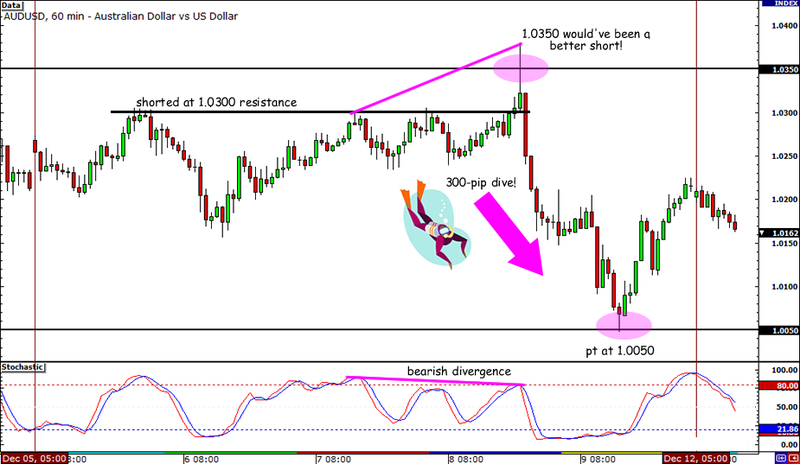 I managed to catch a tiny chunk of the 300-pip move with my AUD/USD short trade idea last week as I sold at the 1.0300 resistance and locked in some pips at 1.0250. You see, the resistance at 1.0300 held for a few days before the pair spiked to 1.0350. Although I’m a wee bit disappointed with myself for missing the entire 300-pip drop all the way down to 1.0050, I’m still patting myself on the back for practicing proper risk management with my recent trade. Had I simply left the rest of my position open without moving my stop to entry, I would’ve gotten stopped out at my 1.0340 original stop loss anyway. Besides, it was meant to be a short-term trade and I just decided to stick with my plan. In retrospect though, I know I could’ve played this setup better with a wider stop. After all, the central bank statements and the EU summit were bound to bring extra volatility to the table, right? With a simple 100/1/1 STA, I could’ve caught a 6-to-1 win! Hopefully I get to catch another good wave this week and be able to ride it all the way up or down. Are you seeing any comdoll trade setups you think I should keep an eye on? Hit me up! The comdolls started the week chillin’ like ice cream fillin’ as the currency bulls and bears battled over risk appetite. The comdolls posted gains during the Asian session on Monday, but threats of credit rating agency S&P downgrading more than a few euro zone states soon took its toll on risk appetite. On Tuesday the possibility of multiple credit rating downgrades continued to weigh on the high-yielding comdolls. The Loonie was an exception though, because Canada posted better-than-expected reports on that day. The BOC not only kept its interest rates steady at 1.00%, it was also less dovish than markets had expected. On top of that, Canada’s building permits and IVEY PMI also surprised to the upside. Meanwhile, the RBA cut its interest rates by 0.25% to 4.25% as analysts had predicted. Around the middle of the week the major comdoll pairs remained in their tight intraweek ranges as investors waited for the ECB interest rate decision, as well as ECB President Mario Draghi’s speech. Still, it didn’t stop Australia from releasing its employment numbers! As I have discussed in my recent AUD/USD range trade, Australia’sunemployment rate surprisingly rose to 5.3% in November with a net 6,300 workers losing their jobs for the month. By the end of the week all eyes were on the euro region as traders reacted to mixed reports from the euro zone. Investors were initially disappointed by the ECB’s lack of plans for more government-buying, but by the end of the EU Summit, the markets were relieved to find out that the European officials had at least agreed on some issues. As it turned out, the ESM is now scheduled to be implemented a year earlier than expected; there will be an automatic sanction for euro zone states with high budget deficit, and bond investors won’t be worrying too much about absorbing losses the way they were forced to do in Greece’s case. AUD/USD ended the week down 52 pips to 1.0216, USD/CAD is up 24 pips 1.0184, and NZD/USD suffered a 52-pip loss at .7753. So, did I miss anything? If so, don’t hesitate to tell me! By the way, would any of you like to share some levels that you’re watching in any comdoll pairs? Who knows, maybe many other fellow comdoll traders are watching the same thing! I’ll be right here on one of these pages!